Little Orbit, a worldwide game publisher, announced today that it has entered into a licensing agreement with Warner Bros. Interactive Entertainment for the Young Justice: Legacy video game set to ship in early 2013 for PlayStation®3 computer entertainment system, the Xbox 360® video game and entertainment system from Microsoft, Nintendo’s Wii(TM) system, and the Nintendo DS(TM) hand held system. New episodes of the Warner Bros. Animation series Young Justice will air beginning Saturday, March 3, at 10:30 a.m. ET/PT on Cartoon Network as part of DC Nation, the network’s brand-new one-hour block of exclusive kids’ television programming and shorts based on DC Comics characters. In Young Justice, teenage heroes Robin, Aqualad, Kid Flash, Superboy, Miss Martian and Artemis are tasked by the Justice League to act as their covert operations team. Armed with superior skills, weaponry and powers, the team must do battle against a wide array of villains from the DC Universe while trying to prove to themselves, and to their superhero mentors, that they too have what it takes to be a hero. Their journey is further complicated when they face the many unpredictable obstacles that arise in their path from inexperience and youth. You can click on the art below for a bigger version! 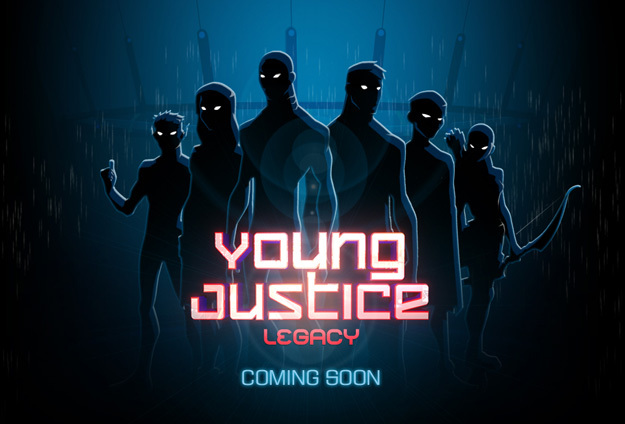 You can also check out the official website at YoungJusticeLegacy.com and the game’s Facebook page at Facebook.com/YoungJusticeLegacy.